Ji Eun Jung is originally from South(Republic of) Korea and a professional Korean traditional musician playing kayagum(or gayageum) which is a Korean traditinal harp. She did her BA in Korean Traditional Music at Ewha Woman’s University and MA in Asian Music at Dong Gook University in Korea, and she's an Initiator of Korea’s Important Intangible Cultural Asset No.23 Sanjo in the style of Jook Pa Kim. She plays the both traditional 12 string kayagum and the modern 25 string kayagum, and also she composes music and sings. Since she settled in London in 2005, she has been actively performing, composing music, teaching kayagum and organazing music events in UK and Europe. 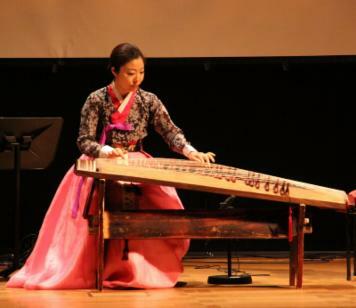 Currently, she is the chairwoman of Korean Artists Assosciation UK and teaching kayagum at Korean Cultural Centre in UK.